This time of year I must admit is a bit of a mixed bag for me and probably, in reality, it is the same for most people. It is a time filled with hope, anticipation and gritty determination. Hello 2018! It is nice to meet you. This time of year I must admit is a bit of a mixed bag for me and probably, in reality, it is the same for most people. It is a time filled with hope, anticipation and gritty determination. And depending on the state of your previous year the new one can be met with anything from welcome to relief to trepidation. Last year was a personally tough one for me so I was happy to see the New Year in and say goodbye to 2017. I am a dreamer and love that in January the whole year stretches ahead with stoic potential. While some are relieved the festivities are over by mid-month, that the loneliness or stress of an empty or chaotic Christmas is tucked neatly behind them, I am always fortunate enough to be a little sad. I travel to my hometown for Christmas each year and I always find it hard to swallow the inevitable ‘goodbye till next time’ when I leave. 10 years on and I find the town and the coastline still has my heart as do my dear family members that still live there. The aqua waters, white sand, lazy sleep ins and family board games have been replaced with the urban sprawl and oven like temperatures of Perth. So as I settle back in to city life, I also start the year networking, collaborating and setting up projects and workshops for the year. This usually means a lot of tea drinking, planning and organising. It also means chatting to new peers, potential colleagues and most importantly potential clients- which I love. One of the things I find myself talking a lot about is art therapy. Yes that sounds silly, I am an art therapist. But I what I mean is what it actually is and what it can offer people and their children. So in my next post I will try and address some of the commonly asked questions and give you all a bit of a review of what art therapy can be. This year I will continue to post activity ideas, write my musings about my profession and also offer some thoughts and topics about child, adolescent and adult wellbeing and mental health. I am always open to questions and requests for specific content, so if there is something you would like to see more of please e-mail me or comment below. There are a few other things in store for Sunflower and Ivy this year and I look very much forward to sharing them with you and having you on the journey as the business grows. 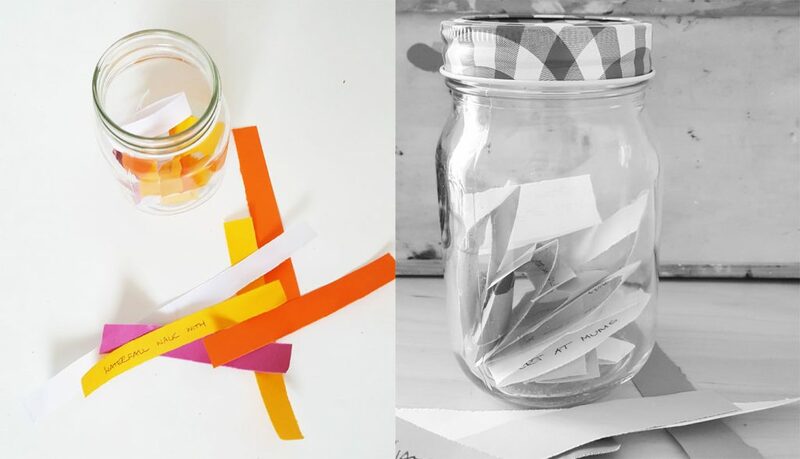 For now I thought I would share an activity that is nice to start in the New Year – a memory jar. If you follow me on Instagram you will recognise it from a post in late 2017. It’s not a new idea and it’s certainly not mine. You may recognise it already, as variations of the memory jar have been circling around Pinterest in particular for a few years. I can’t recommend having a memory jar highly enough. It is a beautiful idea. When you experience a heart-warming, joyful moment write it down on a strip of paper and put it in the jar. Continue until the New Year or when things are really tough and you need the memories. Open your memory jar somewhere quiet with a cup of tea and slice of cake and read over all the golden and sometimes giggle worthy memories. You can make your own jar or a family one. It is amazing to see what memories spouses or children hold close to their hearts, especially if you don’t know what they have written until they are read at the end of the year. Tip: There is no rule about how a memory qualifies for the memory jar. You may have 5 in one week and then none to add for months. It may be a big memory such as a holiday or a simple memory of smelling the first roses in the garden. Once it is open or full and all the paper has been read, I like the idea of pasting them into a journal or scrapbook, titled with the year. Then they can be looked back on for years to come. There are a few hidden lessons in memory jars. Most obviously they have heart-warming potential and can act as miniature time capsules, but they also have a way of giving you perspective on what you value. I was surprised on looking back in 2017 that my entire jar was experiences with other people and not one work-related memory was in there. I love my job. But in many ways jobs don’t define all of who we are. The second thing is that it reminds you to be grateful and to have a balanced view of your life. Even during the most terrible year with a relatively empty jar, there should still be some things to value and be grateful for and trust me at the end of the tough year, you’ll want those gems to hold onto. As the Instagram hashtag goes #livethelittlethings. Gratitude is an important thing for children and adolescents to learn, it is attached to empathy, humility, modesty and hope amongst other things. This activity empowers them to notice their own values without anyone superimposing what they should be grateful for. The lesson of gratitude is much better learnt through experience rather than teaching. It is also an opportunity for them to notice differences in what people remember and treasure.